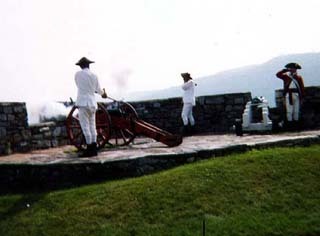 Fort Ticonderoga: One of the strategic "choke" points in Upstate New York. It is now a major tourist attractions in the Adirondacks. 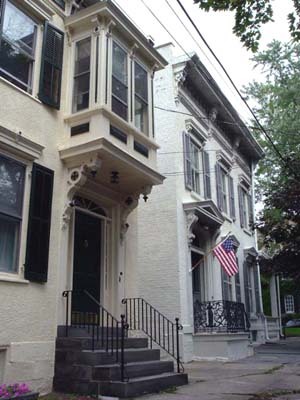 The Stockade District in Schenectady: This historic neighborhood along the Mohawk River was first settled in Dutch times. In the 17th and 18th centuries this was the frontier, hence the need for a protective stockade. Mary Jemison: One of the casulties of the wars on the frontier were civilian prisoners. 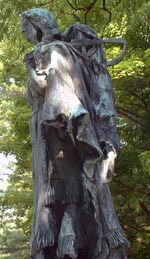 Mary Jemison was taken prisoner in the French and Indian War, and she later chose to live with the Seneca people in the Genesee Country. She is now buried in Letchworth State Park. 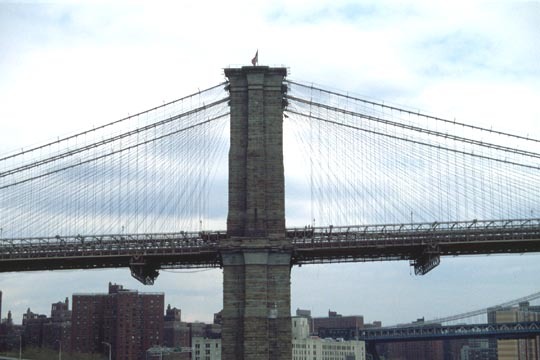 The Brooklyn Bridge was built over the East River. A sheltered harbor surrounding most of New York City is one of the reasons why it became America's First City. 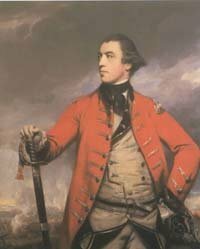 General John Burgoyne: He planned the grand scheme for a British victory in the Revolution. In 1777 he sailed and marched down from Quebec into the Hudson Valley. Other armies were supposed to attack from the Mohawk and the Lower Hudson. That didn't happen, and he was forced to surrender at Saratoga, a turning point in the war. 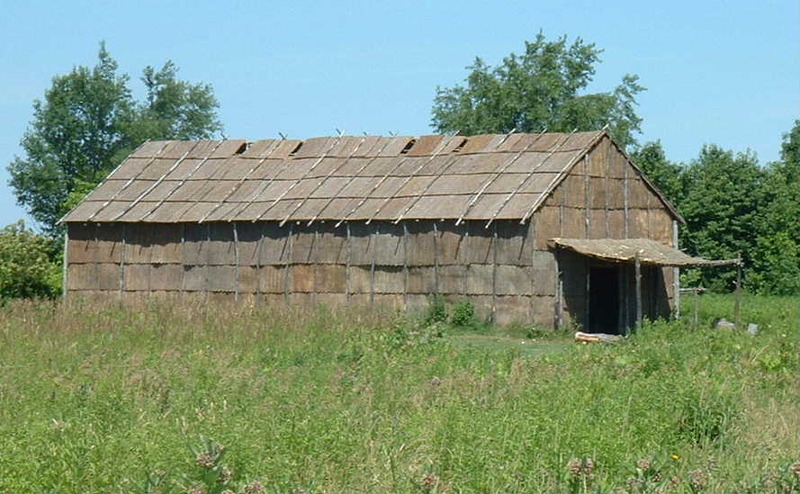 Ganondagan State Historic Park was established on the site of a 17th century Seneca village (just south of Victor in Ontario County). The village was the home to 3000 people, but it was destroyed by the French in 1664. 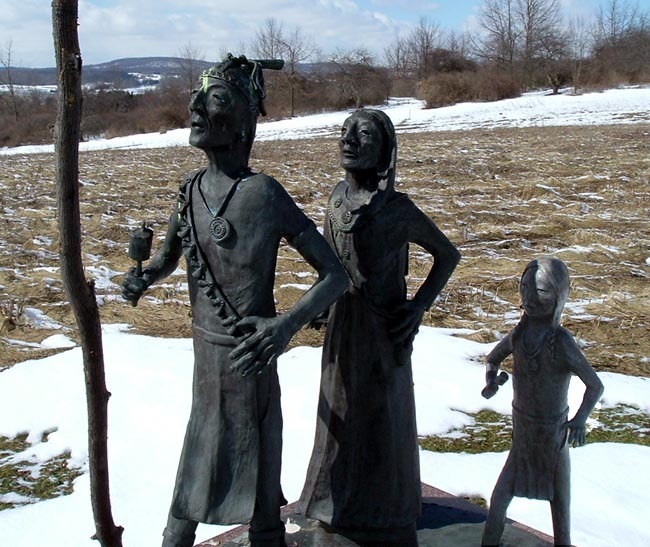 Today the park honors and interprets the culture of the Seneca people. Geography is NOT sn indoor sport! Get out and explore the Empire State! The patterns of settlement and the history of New York are a function of the physical landscape of the state. The majority of people from the days of Native Americans to the present have always lived along the "L" shaped curve from New York Harbor to Albany to Syracuse and on to Buffalo. This is where the waterways make transportation easiest, avoiding the highlands of the Catskills or the Adirondacks. These water routes were also the focal point of conflict, between Iroquois (or Haudenosaunee) and the Algonquin peoples, the French and the British, the Americans and the British. Whoever controlled Lake Champlain, the Hudson Valley, and the Mohawk River had power. They held the key to transportation from the Great Lakes (and often beyond) to the Atlantic Coast. 3. The portage between Lake George and Lake Champlain at Ticonderoga. 4. The portage between the Mohawk River and Oneida Lake at Rome. 5. The Niagara River, especially the detour around the Falls. Their traditional homeland lies along the route between Buffalo and Albany. The nations include from west to east: the Senecas, the Cayugas, the Onondagas, the Oneidas, and the Mohawks. The sixth group, the Tuscaroras, joined in the 17th century. Because they lived on fertile soil, they were agricultural people, depending on crops of corn, beans, and squash ("The Three Sisters") for their survival. The Haudenosaunee had a unique form of government for its time. 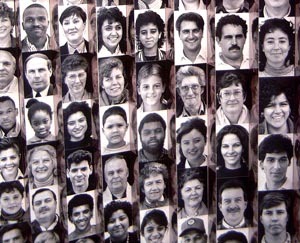 All nations were involved in important decisions, and the leaders of the people were chosen by the women. They were a formidable force, due to their cohesiveness. Their unity was dependent on geography, at least in part. The ease of transportation from one nation to the others allowed for effective communication. The Haudenosaunee could mobilize war parties to attack other native peoples (especially their enemies the Hurons in Canada, and the Mohicans in southern New York). They also held the balance of power between the British and the French. From the days of Samuel Champlain, the French were their adversaries, and they are largely responsible for the British victory in the French and Indian Wars, which drove France out of the New World. The Haudenosaunee held their own, more-or-less, for about two centuries as different European groups invaded their homeland. The Dutch settled in the Hudson Valley. Everyone knows the story of how they bought Manhattan Island for the equivalent of $24. Many geographic names in the eastern part of the state go back to the days of New Netherlands: Brooklyn, Bronx, Peekskill, Amsterdam, Kinderhook - just to name a few. But the British wrestled control from the Dutch in 1664, and the colony was renamed New York. the French Castle, is in the background. Meanwhile the French were establishing forts and trading centers on the St. Lawrence River, Lake Champlain, and in Niagara Country. Of course, they recognized the strategic importance of these places for the fur trade and for protecting their holdings in Canada and the Ohio Valley. One of these forts was built at the mouth of the Niagara River (shown at the left), controlling access to the Upper Great Lakes. 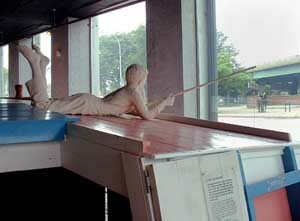 (For more information about the fort, visit Niagara Frontier). The British and their colonists found this situation to be intolerable, and a series of wars were fought. The last conflict, known as the French and Indians War in this country, resulted in a crushing defeat for France, and she was forced to relinquish her North American territories, including Canada. All of the strategic points in New York were under the control of the British crown. Well, at least for a little while… The colonists were getting restless! New York's unique position among the thirteen colonies made it the focal point of the American Revolution. It is between New England and the Southern Colonies, and it is the connecting corridor to the Great Lakes and the Ohio Valley. When the uprising broke out in 1775, all the players - the British, the American Rebels ("Patriots"), the American Loyalists ("Tories"), and the Six Nations of the Haudenosaunee all understood that control of New York was necessary for victory. Shortly after the Declaration of Independence was ratified and announced, His Majesty's Navy attacked New York City. Although Gen. Washington's troops fought hard, they were no match at that time, and the world's greatest harbor fell into British hands, and stayed that way until the war ended. However, the Americans held onto the Hudson and the Mohawk valleys. Fort Ticonderoga (which controlled the important portage between Lake Champlain and Lake George) was captured very early in the conflict by Ethan Allen and Benedict Arnold. 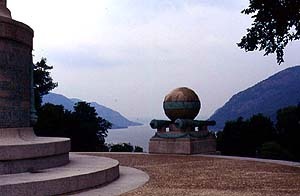 West Point in the Hudson Highlands (pictured at the right) and Fort Stanwix in Rome were also in Patriot hands. However, things were not quiet in Upstate New York. In fact, it was a civil war. Loyalists fought the rebels and the Haudenosaunee confederacy split into pro-American camps (Oneidas and Tuscaroras) and pro-British camps (Mohawks, Cayugas, Onondagas, and Senecas). This was the background for Henry Fonda's famous flick, Drums Along the Mohawk. Enter General Johnny Burgoyne. He knew his geography, well, mostly. Burgoyne planned a three-pronged attack to conquer rebellious New York State. He would march and sail down the Lake Champlain corridor from Quebec. Another army would leave the comfort of New York City and march up the Hudson, and a smaller army would sail up the St. Lawrence and into Lake Ontario, landing at Oswego. They would then cross the portage at Rome and go down the Mohawk River. 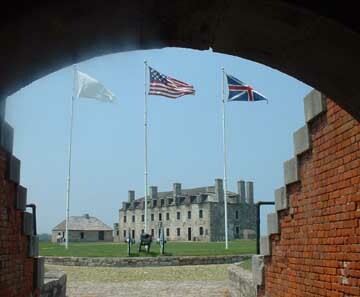 All three armies would meet at Albany, and all five very strategic points mentioned above would be under their thumb (Fort Niagara was under British control until 1792). On paper it was a great idea. But putting this into practice was a whole other issue. First, General Howe did not lead any troops up the Hudson until it was too late. He attacked Philadelphia instead. The third contingent, under the leadership of Barry St. Leger, made it to Rome, where they placed Fort Stanwix under siege. At nearby Oriskany, American troops and their native allies clashed with St. Leger's army and his Iroquois allies. It was basically a victory for the British, but they eventually gave up their siege at Rome and went back to Canada. Burgoyne, in short, was alone. 1. Benedict Arnold, a hero at Saratoga, became an infamous traitor at West Point (see Hudson Valley). 2. The Clinton-Sullivan campaign in 1779 was an attempt by the Americans to crush the Haudonesaunee. Their troops marched throughout the Finger Lakes and the Genesee Valley, destroying the crops and towns of the Seneca and Cayuga. The Six Nations never recovered from this disaster. The British lost their American colonies, but the Haudonaunee lost most of their homeland.